“My daughters and I moved to New York City two weeks before 9/11. 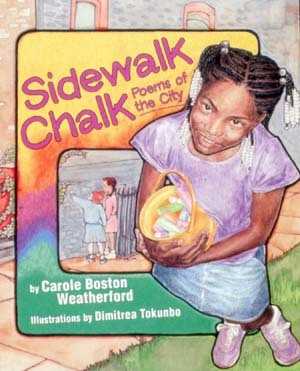 I had my first book as an illustrator coming out, Sidewalk Chalk: Poems of the City, by Carole Boston Weatherford. I thought I could work part-time in the Scholastic bookstore and get my illustration career off the ground but quickly found that my technique of layering colored pencil over water color paints, while juggling two small children and a part-time job, wasn’t working and it wasn’t bringing in enough money quickly enough to survive in this city. 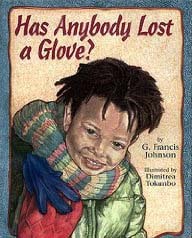 I got a job as a part-time receptionist at Scholastic and did my second published book as an illustrator, Has Anybody Lost a Glove?, written by G. Frances Johnson, still using the colored pencil/watercolor technique. At around the same time, I started doing work for Cricket Magazine as an illustrator. After about a year, I had to get a full time job or I wouldn’t be able to stay in the city. Lucky for me, I got that job at Scholastic in the marketing department. It took so much time that I stopped illustrating books. 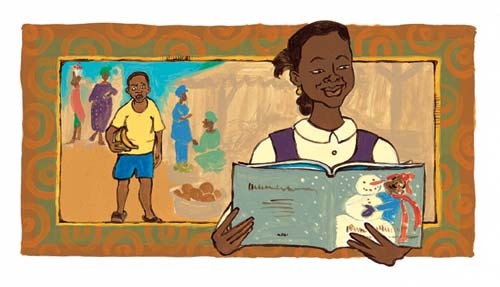 I started writing and illustrating stories for a magazine Scholastic started with the Urban league to promote literacy in the inner cities, named Read & Rise. Writing for Read & Rise led to the publishing of my first book as an author, Together, illustrated by Jennifer Gwynne Oliver. 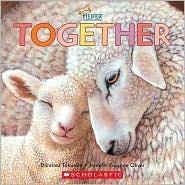 Shortly after Together came out, I moved from the Scholastic’s Marketing department to their Legal dept. For financial stability, it seemed I was moving further away from my dreams of doing children’s books. In desperation, I started doing self portraits (one a month) using acrylic paints in part to find a new technique and in part to stay in touch with my inner artist. By the time I got to my third self portrait, I wrote The Sound of Kwanzaa, illustrated by Lisa Cohen, to be released fall 2009 by Scholastic. Only months later, I was approached by Tillbury House via email to illustrate Amadi’s Snowman. I sent them a sample using my new acrylic technique and they hired me. The illustration opening this post and the one below are “samples in the ‘Amadi’ style acrylics,” Dimitrea told me. We thank her very much for stopping by this morning, and we wish her the best of luck in capturing that dream day job. 2). Blog the Vote 2008. 3). Eisha’s post from Friday and everyone’s celebratory songs. 4). I received beautiful, amazing, thoughtful, hand-crafted surprises from illustrator Elisa Kleven in the mail this week. 5). Taking a walk with my girls this week. I’m posting this pic below from our walk, ’cause Eisha gave them those kickin’ sunglasses. 6). My whole family got a stomach bug this week (making me behind on a lot of things, including reading my favorite blogs), and it was u-g-l-y. But now I’m grateful and feelin’ kicky indeed to be vertical again, along with my family, and the other kick is that Jama sent me a get-well card, ’cause she’s thoughtful like that. 7). Did I mention President-elect Obama (and the great new web site)? Here’s how Tuesday night was for us: My husband and I were glued to every second of the election-results coverage. We had a bottle of wine ready. My youngest was vomiting all night (bless her big punkin heart), and, even though I felt awful for her, I admit I was hoping she’d most certainly hold off during his victory speech. We were in tears as we watched it, and then I woke up my four-year-old to tell her that Rock Obomo, as she calls him, had won, and that’s when I really lost it. Then, I actually knelt on the floor and prayed, something I don’t often do, in case some higher power might be listening, that the crazies of the world will not harm this man and that he be guided by strength and courage and wisdom, given the tasks before him. What about you? Tell us about your Tuesday night in your kicks, if you’re so inclined. 1* Love that first illustration especially. That girl looks sassy! 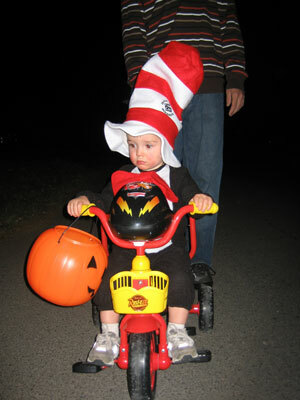 2* How cute is my nephew as a surly Cat in the Hat for Halloween? 3* I can’t believe Jules’s girls can still wear those sunglasses. 4* I got new glasses of my own. They’re wicked cute, and OMIGOD I can see!!! When I got them, though, I was disappointed to see that a couple of the super-cute rhinestones had already fallen out of the frame – probably when they were putting the lenses in. Unfortunately, they didn’t have another frame like mine to replace them. But they did give me a discount, and I used it to get the frames re-rhinestoned at a jewelry repair place. 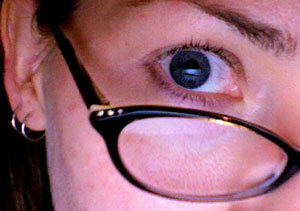 They turned out perfect (shown below), and did I mention I CAN SEE!!! 5* Well, obviously, the biggest kick of all: PRESIDENT-ELECT BARACK OBAMA! I honestly didn’t believe it could happen – that a big enough majority of our citizens would be at all interested in electing the most noble, most intelligent, and most forward-thinking of all the candidates for the job. Not to mention what kind of obstacle his race might prove to be for a certain nasty segment of the population. The past eight years had made a total cynic of me. I’m so amazed and thrilled to have been proven wrong. Since you ask, Jules, my Tuesday night was spent with my TV and my computer, obsessively monitoring the incoming vote tallies with my fingers crossed. As I mentioned Friday, my husband was at a rehearsal, and didn’t get home until after the results were announced, so I was all alone with my anxiety. Even as Pennsylvania, and then Ohio, and finally the entire country were called for Obama, I still couldn’t quite believe it until I saw McCain walk out to deliver his gracious concession speech. And of course I stayed up to hear Obama’s wondrous and inspirational speech – by then B. had come home, and we watched it together. And I was so proud and so glad and so hopeful for the first time in so very long. I didn’t sleep much that night, and there was a lot of spontaneous squealing and hugging and happy-dancing at work the next day between me and my like-minded colleagues. That’s plenty of kicks for me on this most happy of weeks. How about you all? Dimitrea: You capture facial expressions very well. I like your layered technique. Jules: Their futures are so bright, they’ve gotta wear shades. 1) Wow, Obama was a real kick. The world was watching and cheering with you — I had tears in my eyes watching his acceptance speech from Canada, because the planet suddenly felt safer and more hopeful. 2) Finished three great books since my last kicks a couple of weeks ago, ones you’ve all read long ago, but I loved them: new Penderwicks, new Mysterious Benedict Society, and Savvy. Ivy (7) adores both Penderwicks books…like pretty much her favorites ever. Also re-read Charlie and the Chocolate Factory with both girls this week. 3) I finally put together a belated birthday video and post for my younger daughter. Watching her delight as she watched it was a highlight of my week. 4) The highway between my house and the office has been closed for a couple of weeks, meaning that I have a great excuse to never go into the office. 5) Beer night tonight with two good friends. 7) Halloween festivities — I was a bit of a Halloween Humbug until we had kids. Now it’s the best. Eisha, I’m jealous of your great specs. I so need new ones, and have just been too lazy. Perhaps this will be the kick I needed…pun intended. Wow, Dimitrea Tokunbo really had a fantastically rich painting style. I very much like the acrylic technique, and the swirls in that book make the characters seem ready to break into dance at any time. How very cool! * I have to say that my one big kick — for this week and weeks to come — is that my cynical self (like Eisha’s) has had to stagger into a corner and sit down and gawk. Faith has muscled down cynicism for awhile. * To have found an enameled copper ring I was given by friend in college. I thought I’d left on a bus — I found it at my chiropractor’s office — two weeks later. Someone found it, turned it in, and there it sat, at the front desk, looking smug. Somehow, even the cheapest little bits of costume jewelry are so precious when they have stories attached, and I’m so pleased to have this back. * To have found a pair of cute comfy flats that didn’t break the bank — and since I hate shopping, and had to go to four stores, this was a serious feat. * To have listened to the hail hit the window this morning. Now I need rhinestones for something, too. The illustrations are so vibrant. Jules, those girls are way too precious! A photo of my granddaughter with sunglasses is a fave. Love the look yours have. Eisha, the specs are fabulous!! And your nephew, cute, cute, cute. 1. The election! Came home from Family Library Night (where parents did not share same view) to watch results with Chuck and der friends. What a moment. AND the library measure passed. Yippee. 3. My first bazaar and actually sold some cards and a necklace. 5. Having her parents, sister, and other grandmother for dinner. 6. The pesto chicken pasta I made was delish. 7.Just found out I am going with a team of 6 colleagues to Denver in February for the Thinking Strateiges Institute. Love the colorful artwork–and those little cuties wearing sunglasses! 1. Tuesday night at the Lyceum Restaurant in Salem with other liberals and socialists awaiting election returns–and then whooping and hollering when the winner was announced. I felt like yelling: Pinch me now! 2. The positive reaction around the world to the US President-Elect. 3. I ordered buttons and lapel pins and other memorabilia from the Obama store before the election. I can’t wait until everything arrives in the mail. 4. Our reading council dinner on Wednesday night. We hosted a panel discussion with three talented children’s picture authors and illustrators: Matt Tavares, Daniel J. Mahoney, and Wade Zahares. It was terrific. After people left the yacht club, Matt and his wife Sara, Dan, Wade, and I chatted about the election, children’s books, etc. What nice guys they are. 5. I didn’t have an opportunity to write about the Keene State College Children’s Literature Festival last Sunday. It was great. Eric A. Kimmel’s presentation was funny and engaging. What a storyteller! The other speakers were wonderful, too. 6. I cleaned off my computer table last night. Piles of books were leaning precariously on the top. I also organized the piles on my other table. It was becoming hard to find anything in my office/library. 7. I feel hope again about my country. I think the present administration has led us down a dark road these past eight years. I am hopeful that we can turn around and head toward the light once more. Beautiful, rich, vibrant work by Dimitrea! Thanks for sharing her work. I see that today is optical day — adorable girls in sunglasses, and lovely Eisha in rhinestones. Cute nephew — LOVE the hat :)! Hope the bug is gone from your house, Jules. 1. Obama, of course. I’m still trying to process everything and it’s been very emotional — smiling and ecstatic one moment, teary-eyed the next. He actually won! Like you, Jules, along with my joy came my worry-self, praying that God will keep him safe, since every time in the past we’ve loved and believed in somebody with all our hearts, they’ve been taken away. So I’m trying to stay positive. 2. A man born in Hawai’i was elected President. For so long, many thought Hawai’i wasn’t even good enough to be a state. 3. Virginia turned into a blue state!! Finally. I’m proud to be a Northern Virginian. 4. Blog the Vote. Kudos to Colleen, Lee and Gregory for the brilliant idea! 5. And, in non-election related kickiness, I met Laurie Halse Anderson at a booksigning. She’s so awesome. 6. My new crush is Jakob Dylan. Been hooked on his recent CD, “seeing things.” He’s definitely hubba hubba. Why didn’t you guys tell me? 7. MotherReader and Lee Wind’s Comment Challenge. Great fun finding new blogs and having new people comment on my blog. Have a good week, everyone. Change. Has. Come. I am new to Dimitrea’s art. I must check out her books. I love her style. Jules, I am so glad you all are better. Eisha, Those new glasses RULE. Little Willow, I love that you’re always singing. 1. Like so many other people, I’ve had to reevaluate my cynicism this week, and it’s been a good thing. I’m paying a bit of attention to the news again. It was after the 2004 election that I swore off it for good, and it feels good to be able to care again. 2. I watched Vernon, Florida the other night, and I don’t know how I managed to live so long without hearing the “therefore” sermon, but if I knew someone around here was giving sermons like that on Sundays, I’d go listen to that person every week. I’m laughing just thinking about it. 3. I did a couple presentations at work this week, and they worked out well. 4. Plus, Jason (my co-children’s-librarian/partner-in-crime) is back to work after his knee surgery. It’s really good to have him back in the library where he belongs. 5. Yesterday I spent a long afternoon hanging out with a friend talking and drinking tea and catching up. 6. After the long afternoon, I made us red cabbage with apples for dinner. I’d never cooked cabbage in my life before, but it turned out ever-so-yummy. 7. I found a CSA that does winter shares, and I signed up–so in January, February, and March, I’ll have nice fresh supplies of wonderful things like potatoes and garlic and onions and cabbage and kale. Mmmm. I love how warm, energetic, and ALIVE the artwork is, especially the first girl, and then the one of three girls. Lovely. Very fun that this week is centered around sight, especially since we are all now eagerly looking forward to the future. : ) So damn happy! 1. Barack Obama, our new President-Elect! 2. His incredibly moving acceptance speech. I had tears streaming down my face while watching from home, and even the usually stoic bf got misty-eyed. The last photo of Obama captures his noble elegance during his acceptance speech. Beautiful! 4. All the spontaneous eruptions of joy surrounding the election! Friends called and texted me once the news broke, and my office has been insane this past week, everyone smiles enormously as they pass each other in hallways or on the street. Contagious joy! 5. Went to a phone-calling party Monday night in Oregon for Prop 2 in California. It was an all-girl, all-vegan dinner and phone call event and was very positive and fun. And a nice way to channel nerves about Tuesday. 7. Reading about all the joy and emotions on eisha’s post here this week, as well as all over the web. Makes me tear up all over again. I do hear America singing again, and it is so wonderful to hear. Gorgeous illustrations this week! And great pix of specs–both the kids and Eisha’s new ones. Cool! 1. So many of us have the same kicks this week–that may be my biggest kick of all, to be feeling like part of something American again. I’ve felt so alienated from this country for so long. 2. Canvassing in the rain with the whole family on Tuesday. 3. Seeing VA go blue. Maybe I will claim it as my home state (I’ve lived here longer than anywhere else) after all. 4. Seeing Obama’s speech Tuesday night. 6. Lovely dinner with like-minded friends last night–introducing two women I know will be friends. 7. 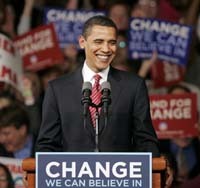 President-Elect Barack Hussein Obama. I just can’t say it often enough. Man — Dimitrea Tokunbo’s stuff really kicks! I especially second little willow’s comment about the expressive faces; people’s souls just spring off the page. adrienne: I live in N. Florida. The Missus and I were driving a few years ago from our place to a friend’s over in Panama City and decided to take back roads. When we saw a sign pointing to Vernon we both started screaming and laughing. Decided ultimately not to take the side trip; it may turn out to be a place we prefer to hold in imagination rather than memory, y’know? That’s a great movie. * Election Night (tears and laughter and disbelief and happiness) and the day after (LOTS of smiles, people holding the door for one another, and a welcome drop in the volume of simply forwarded email). * Continuing to find occasional gems in a “work in progress” that’s over 15 years old which hasn’t been re-read in a long time. * Reading up on Poe again, thanks to your Halloween Poetry Friday “Ulalume” contribution. * Guilty pleasure: the Third Rock from the Sun marathon on TV Land. Jules, am glad you got a nice walk in before the dreaded lurgy hit! Eisha they are rockin specs! And your nephew is SO CUTE in his hat. 1. Seeing the excitement in the US over the election (such long lines!) and the joy so many of my US friends felt at the result. I too feel relieved and hopeful! 2. The car had been playing up so went in for an early service, but it was something relatively inexpensive to fix. Phew! 5. Cooking experiment of this week were museli (aka granola) bars. They were slightly squishy but a valiant first attempt. Am unsure I actually saved any money by the time I finished adding in various dried fruits, but hey. 6. I got to go to the a meeting at the Houses of Parliament! It wasn’t anything high powered (in fact it turned out to be equally worthwhile for the wacky and entertaining people attending as for the content) but it was supremely cool going inside such a famous place for work! 7. After all this time we finally checked out a nearby Asian supermarket, and found lots of goodies including sauces and pastes and even those cute yummy chocolate koala biscuits from Japan! Thanks to everyone for visiting. This bug of mine is still stubbornly lingering, not to mention we’ve got an Internet service provider issue right now, so I’m chiming in to say hi while I’m connected and before I go crash again. Little Willow, I think “sight rules” has to be the most kicky kick of all, as in the most let’s-appreciate-the-simple-things kick. Hee. I need new glasses, too, so Eisha’s being inspiring here. P.S. Eisha, your nephew is a great disgruntled Cat in the Hat. Jeremy, I have yet to read Mysterious Benedict Society. Glad you enjoyed all those titles, and happy birthday to your beautiful daughter! I couldn’t watch the video — it wouldn’t load. Maybe it’s my connection?? TadMack, glad you found your special ring. And what is chocolate beet cake?? As a beet fan, I’m intrigued. Jone, what will the Thinking Strategies Institute be? And congrats on a very nice week, indeed. Same to you, Elaine. You were a busy bee this week. The Keene State Festival sounds like it was great. Jama, thanks for the music tip. I’ll have to look into that. I’ve heard of him but haven’t heard him much. And congrats on your blue state-edness. Adrienne, congrats on finding the CSA. …and what is “Vernon, Florida”? I’ll have to look this up. The way you feel about that sermon is the way I feel about Haven Kimmel’s character of Amos Townsend in her Hopwood trilogy — I’d go to his church if he existed and I could hear him speak. RM, thanks for the body language link. I’ll read that when the room isn’t spinning and my connection is better. Oh, and it’s good to connect your name and face in that picture. And all that work for a good cause! Libby, congrats to you, too, on your blue state-edness — and how all your canvassing/volunteer work paid off! JES, my husband and I are on Season Five of The Sopranos. I’m not sure I want it to end. We’re watching sloooowly. ….thanks also for the link to the project, which I’ll have to look at later. Emmaco, your kicks are a yummy delight, as usual. Even I can acknowledge this now, when I’m finding it hard to eat anything. I’ve never heard of those koala biscuits ’til now. Even the packaging is fun. Not sure I’m even being coherent….slinking away dizzily now to fall into bed again. Thanks to all for visiting. Beautiful illustrations. Amadi is a wonderful character in a great story. 1. Catherine’s birthday. Fun, done! 2. Standing in the front yard with CJ watching snowy leaves descend from a crystal blue sky. 3. Shipping out 132 books to readers in need. 4. DH volunteering to take said books to the mail place. 5. Taking Catherine with me to vote, and having her tell everyone to vote all day. 6. Enjoying the excitement of history … and having a way to show her everything is possible in her own lifetime. 2. Reading the NYT blog with reactions from around the world. So many people were celebrating with us. If you get the chance, read the comments from a huge number of international well-wishers. 3. I’m with Libby on seeing my home state (Virginia) go blue, not just for President, but now both senators as well. 4. Cybils reads. I am having so much fun reading nominees, and have found some real gems. 5. I spent all day Monday leading a workshop for teachers out in a school. It was all math, all day. We had great fun. 6. I spent all day yesterday with teachers and students leading an environmental education workshop. We also had great fun! 7. Finding my mailbox filling with messages because of the comment challenge! I have been such a lazy blogger, writing posts but failing to recognize the hard work of others. It feels so good to get a comment or two. I am determined to take this past the 21 days and make it a regular habit. Hmm…the video was dead for me too this morning. I uploaded it again and now it seems to be fine (if you’re still curious about a tribute to a stranger’s five-year-old). Ivy also finished Savvy this morning, and her eyes were sparkling as she told me that she thought she might have two savvies herself: reading and floating (in water, she’s freakishly bouyant). She adored the book, and put it on a level with the Penderwicks. I went back and read your co-review of it from earlier this year — great review and I agreed with all of it. Oh, and tadmack, chocolate beet cake? That totally trumps my boring attempt. I love beets…any advice for a first try at using them in cake? Oops…forgot about the Mysterious Benedict Society books. I LOVE them, but Ivy’s shown no interest. I wonder if they’re too long and meandering for their target audience, but…quite a lot of fun, and the second one is warmer and faster-paced than the original. I could see gifted/geekier kids really embracing both, but who knows? Jeremy, interesting article, indeed. I re-discovered the fact this week that when you’re sick, it’s even more relentless, huh? And that’s even having had my husband stay home to help (and then, of course, he got sick, too)…but I digress. Anyway, yes, that’s an interesting read, especially that small bit about our evoluntionary compulsions to care for our children. But, as they put it, for all the relentless moments, there are the moments of “happiness…both transcendent and amnesic.” That’s such a perfect way to put it. Terry, happy birthday to Catherine! We also took our daughters with us to vote, and it was very fun. Tricia, I hear ya. I really thought Prop 8 wouldn’t pass. …glad you had such a good week, esp. workshopping. Jone, thanks for the linkage! P.S. If Adrienne’s still reading….my girls and I just re-discovered our copy of Cowboy & Octopus, and I thought of you. My God, that book never stops being funny. Hadn’t read it in a while. Little Willow, I also love that you’re always singing, and always so busy and positive. You’re an inspiration. Jeremy, that video is so sweet! What a fun, precocious, and adorable girl you’ve got there. Glad the girls liked the books, too! TadMack, as someone who took apart the pipeworks under a sink to rescue a 50-cent thrift store necklace, I totally hear you on the sentimental jewelry. I’m so glad you got your ring back. And… okay, I am really dubious on the chocolate beet cake. But I’m glad it made you happy. jone, you are such a mover/shaker. Congrats on the Institute trip, I hope it’s inspiring. Elaine, you hang out with the coolest people, do you know that? I want your life. jama, Jakob Dylan is a total hottie, and I’m sorry I’ve been remiss in not telling you. I haven’t heard anything from his solo album, though – must check it out. adrienne, I’m thinking you and TadMack and me and all the other Reformed Cynics could form a support group, maybe work through how to deal with all this hope and positivity. It’s just weird, isn’t it? Glad to hear Jason’s back to business. rm preston, I admire you and everyone else who put so much time and effort into spreading the word about their causes. I also enjoy getting to put a face with the comments. Libby, you’re in good company if you go with VA as your home state – so many of our fellow bloggers hail from there, and they’re all cool. And I love those photos of the new first family too. JES, that 52/48 project is the coolest thing ever. It makes me want to say: Jules and I are both pretty passionate people, and for the past few weeks we’ve been too excited/nervous to keep our political opinions to ourselves, but I do want to say for the record that I don’t mean to alienate any visitors here who don’t feel the same way we do about the election. Please feel free to comment, no matter what you have to say. Let’s be friends. emmaco, I’m fascinated and impressed that you went to Parliament, and that you tried to make your own granola/muesli bars. Terry, I love your sentence “Fun, done!” That sums up post-party relief beautifully. Tricia, I’m so bummed about Prop 8 too. My sister in SF didn’t think it had a chance. I guess we can’t win them all… but laws can be changed, and changed again. JES, Vernon almost certainly has to be different now; that movie’s over 20 years old now. Brilliant, though. Jules, Vernon, Florida is a documentary–short and very, very funny. Here’s a clip that I think is fairly representative: http://www.youtube.com/watch?v=yDZjyWy84V4&feature=related. Sadly, I cannot find a clip of the sermon. I was just reading Cowboy & Octopus to some coworkers earlier this week as part of one of those presentations I did. Most of them laughed. It is a particular kind of humor, I guess, but I can’t stop laughing at it. Speaking of can’t stop laughing, have you seen the new Elephant & Piggie book, Are You Ready to Play Outside? I keep worrying that I’m not going to like the new books in that series when they come out, but they keep making me laugh. I have requested Dimetrea’s books from the library and am really looking forward to the book of poetry. Tadmack and Emmaco, one of my vegan cookbooks says that prunes work well in chocolate baked goods. I’ve never heard of beets and chocolate, though. Does the beet make it turn purplish brown? I’m picturing a really amazing color right now. JES, I used to live in Niceville. Heard of it? Jeremy, thank you for the word “relentless.” Oh, man. That’s exactly what it is. Blessed and relentless. A messy and exhausting paradox. –The cutest thing I saw all week was either two juvenile giraffes play-fighting or Joey’s 3-year-old preschool class lined up with all of them holding a library book they picked out on their own. –When it came time to select Angel Tree tags for the preschool Christmas project, the boys were driving me crazy fighting over the pictures on the tags. So I tried to get them to focus on selecting a certain age or gender. Nothing interested them until I said, “How about a girl who would be the right age to babysit you?” Ah ha! When we were ready to go buy gifts, I asked them, “What do teenage girls like?” “Color pencils.” “Okay, what else do teenage girls like?” “Shoes!” Jackpot! “What else?” “Lip balm!” Yay! Our teenage Angel Tree girls will be getting gifts lovingly selected for them by a 3-year-old and a 5-year-old who picture them as the nicest, most fun, sweetest babysitters ever: shoe store gift certificates, flavored lip gloss, pink and purple gloves, and multi-color gel pens. Adrienne, nope, haven’t seen the new Elephant & Piggie book, but now I gotsta. Okay…..[time interlude]…just put it on hold at my pubalic liberry. Kathe, your owl and spaceman are adorable. And now I MUST ask: Why did you say toodle-oo to Sesame Street? Just curious….I actually know that ABC song you speak of. Kathe my theoretical knowledge of a beet chocolate cake is that it’s just chocolate colour, rather than a pretty purple 🙂 The beets are like carrots in carrot cake and provide sweetness and moisture. Jules, we left Sesame Street a few years ago when I saw it being more and more dominated by Elmo and his ilk. I couldn’t stand to let the whiny red puppet influence us any longer. I’ve gotta find a chocolate beet cake recipe. My mom used to make chocolate zucchini cake, too. Mmmmmm, crazy. kathe: Niceville — sure! Never been to it, but have been real close by plenty of times, along the Gulf in the Destin area. One of my minor aspirations during however much longer I’m in N. Florida is to make it to the town of Two Egg. Kathe, those costumes are brilliant. I’m especially impressed by the owl beak-glasses combo. I love wearing those owl-beak glasses. So far my boys aren’t embarrassed by me. . .
Hey, that goes along with this week’s spontaneous eye theme! JES, I managed the children’s department of Destin’s Books-A-Million for two years. Greedy development has made Destin the least interesting part of North Florida. Thank goodness for Roadside America. No time to post a whole set of kicks this time, but I would like to include my thoughts on last Tuesday, which in my mind, counts for numerous kicks. For me, it was a privilege to watch history be made, and I don’t see how anyone could fail to be moved by the images of cheering, crying, smiling crowds of people. It was a beautiful sight, and I have high hopes for the future. Word, Zoë. Glad to see you stop by and hope your computer is on the mend. 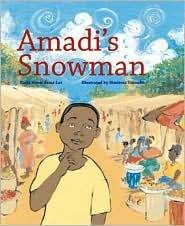 Amadi’s Snowman is a perfect book in my opinion, with the splendid flowing of text and paintings making it unforgettable. Here’s wishing it the Caldecott medal–and further collaborations between Dimetria and Katia!